Abliq, Tintinara, EverHive Chronicle, Thursday 1 September 2016. “It really is not sustainable,” he said, “deriving an identity from opposition to the Sun as I have. It began as a demonstration of what is best in a man: his innovative independence, his imagination and his transcendent spirituality. I took it upon myself to give the highest expression to the insights gained from communion with Woman, to gain Her respect as a partner, utterly different, unreal yet indispensable. As things have evolved, instead of confirming the importance of Man at the periphery, I have confirmed His inauthenticity, and in each woman’s real world merely become a quarrelsome mansplainer. My moments of glory have become no more than antitheses. Well, there you have it. It was a strange occasion, in the car park at Taunton, and I am still coming to grips with what was said. For his part, the Head of Her Majesty’s Nautical Almanac Office offered the customary gratitude for a difficult job well done, but he wasn’t fooling anybody. It is well-known that lunar theory is considered done, and that astronomy and space exploration have bigger fish to fry. “Do whatever you like,” was the body language. According to my American colleague, the reception in California was by contrast lavish, but reaction similarly indifferent, if also nonplussed. After all is said and done, it seems that the month will go ahead. It is far from clear as I go to press what effect the Moon’s announcement, if he, or should I say ‘(s)he’, means to carry it through, will have on the polarity of Sun and Full Moon, and indeed on the whole notion of polarity in astrology, already undermined by the observance of asymmetrical seasonal geometry on one antipodean astrological website. Considerable reassurance is taken by the observance in this graphic of the emergence of a set of hitherto unremarked non-seasonal polarities in which the Moon seems willing to participate. For some time now, astrologers have been sustaining their practice by asserting an influence for the stars beyond the Zodiac, and by connecting planetary longitudes to geographical perspective by means of Houses and what have become known as the Angles. 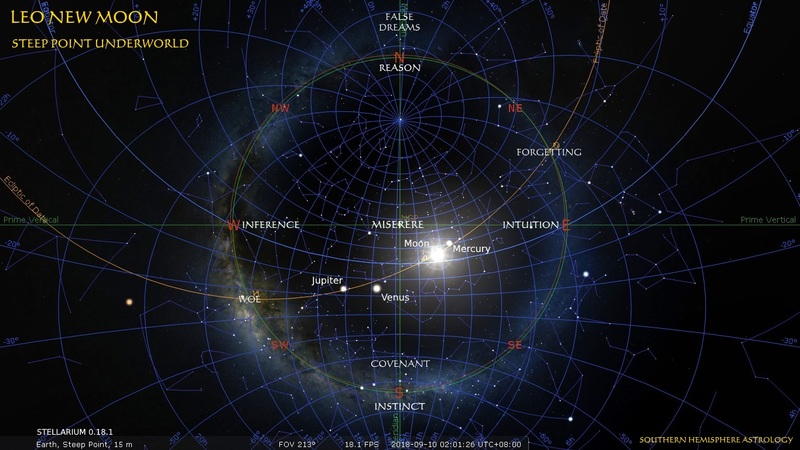 It was only a matter of time before astronomy’s Equatorial Coordinate System was elevated to pre-eminence as the matrix which most conveniently relates the Zodiac and the background stars to the native sky. The measurement of the effect of Earth’s rotational axis has already revealed the exact polarity of a number of the brightest stars, which is expected to greatly enhance the capacity of sidereal astrology to augment the interpretations of observers like Manilius, Ptolemy, Anonymous and others for whom half of the brightest stars were invisible. 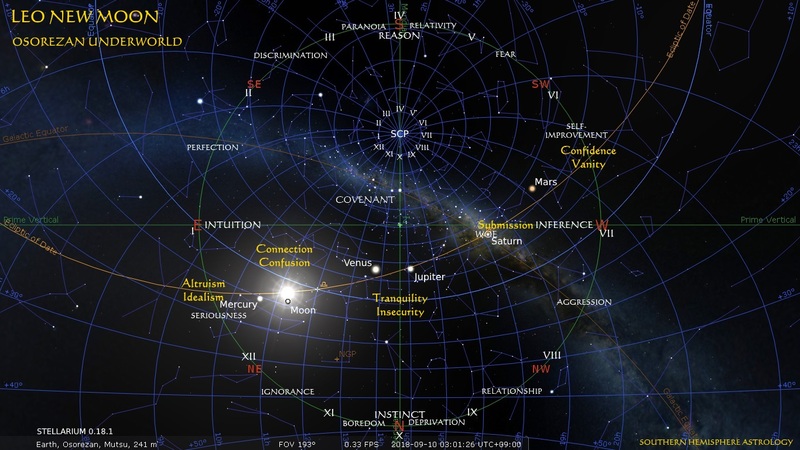 A note of caution: while the use of equatorial coordinates undoubtedly offers a new symmetry to astrology and offers an olive branch to astronomers, there remains some doubt as to the warmth with which conventional astrologers will receive the news that Mercury in Virgo—if you’re on top of your game, you know that notwithstanding 2,000 years of precessional variation, a planet is often in the same tropical and sidereal sign (Google ayanamsa)—is equatorially in Leo. 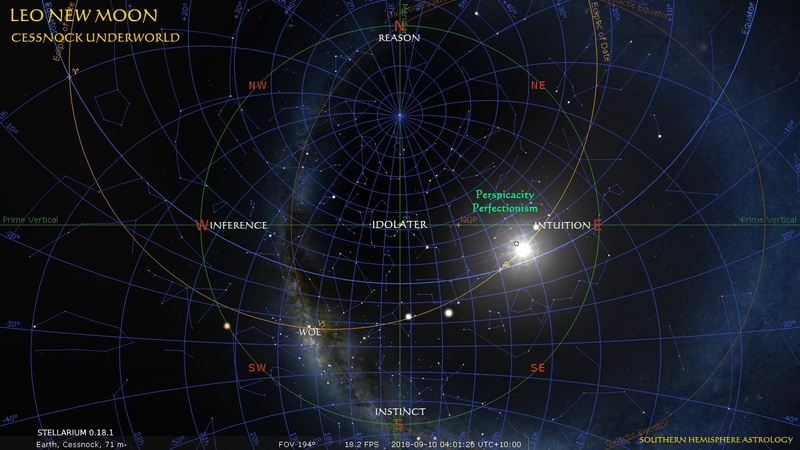 It would seem that the Antipodeans, having turned astrology upside down, feel free to align our symmetrically season-based Sign-boundaries to arbitrarily defined constellations—yet, whether they realize it or not, isn’t that what all siderealists do?—and are more comfortable with ambivalence than we Western and Jyotish adherents of fixed quality systems, in which ambivalence, if it is perceived, is resolved by polarity. We will watch developments in this nascent field with great interest. And of course the Moon has said nothing about abdicating his regularity, so no effect on lunar calendars should be anticipated. It is confirmed that the First Crescent will be visible to the naked eye on Saturday, accompanied for lucky southern hemisphere viewers by a zenith manifestation of the gaseous nebula known since time immemorial to the original antipodeans as The Emu. Suffice to say: may you live in interesting times. Well! What do you make of that? I eventually found the passage I was looking for. Iain Thomson, Stanford Encyclopedia of Philosophy, 2011. I have some thoughts of my own on the content of these two articles. What is revealed by the progression at S.H.A. from ecliptic to equatorial measurement is a pre-eminent, even fetishized, status for ‘North’. North is an entity. It has a history, and is the essence, in Heidegger’s usage of the term, of the zodiac viewed from the south. If I use the term ‘South’ to you in the Northern Hemisphere it resonates with warmth, sensuality and freedom, I suggest. The North has those connotations here in the South, but to immigrants it is also the direction of what we left behind. The southern sky abounds with riches, and half of half the population of southern cities barbecues under it (the people on the south side of east-west streets), and yet seldom do you meet anyone with any familiarity with it. Perhaps its motion has something to do with it: it’s not linear; it has no east and west. I imagine the same applies ‘above’ the equator, and herein we find a difference. North is above us, and south is below you. We live in negative latitudes. North is so fundamental that when we walk southward we know east by imagining ourselves back to front. It is a difficult exercise to imagine you of the North as you are: beneath us. Those bright stars mentioned in the article which are exactly opposite each other are always so, but only form a ‘gate’ due north and south. Your anti-clockwork soul or being is our anti-clockwork ego, and your clockwork ego is our clockwork being, but the meridian is the gyroscope which keeps us all upright upside down. Just one more thought occurs to me. I mentioned North’s history. The site of Melbourne was taken from its indigenous inhabitants in the 1830s. The quickest and easiest way to perform the cadastral survey which imposed order on the land-grab was by the compass, and so Melbourne grew, boundary by parallel boundary, skewed towards the east by the magnetic declination of the day, about 9°. I cannot find another place like it on the globe. North is our “essential strife“. It discloses our being. It is nothing less than a work of art.